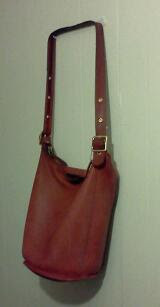 I'm a member of the great group; called Capital Area Fashion & Beauty Bloggers (CapFABB) and we have a "Leather" challenge. So I'm thinking trying to decide how can I participate in the challenge. Being a Thrifty Diva I can't just run out and buy new leather. Then I remember I have the best leather accessory ever. The original Coach Bucket bag in red. This bag was gifted to me about two years ago from my mom. She brought this purse in the 80's from the old Woodword & Lothrop. Love this bag plus its bigger then the new bucket bags. That bag is so great! I totally understand not being able to drop a bunch of cash on new leather, that's the best thing about vintage! Not only do you get a totally affordable item, it's not the same ol' bag everyone will be seen with.